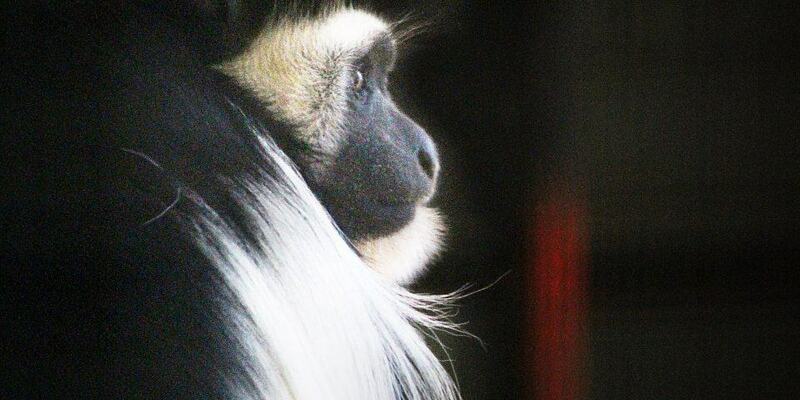 Adelaide Zoo is home to three stunning Black-and-white Colobus monkeys. 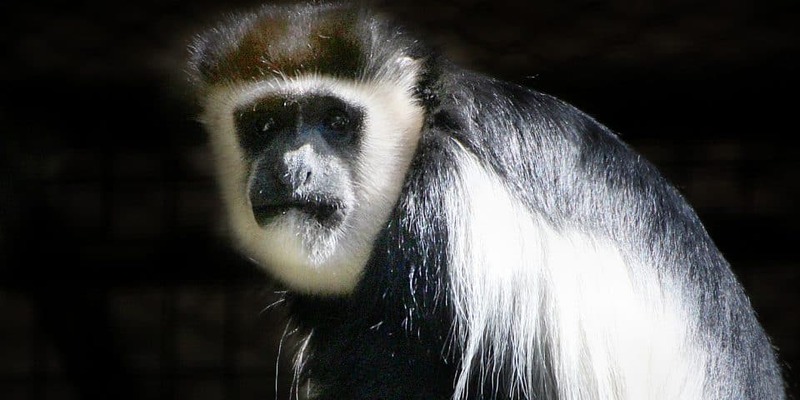 Female colobus Charlie was born at National Zoo and Aquarium in Canberra in 2002, making the journey to Monarto Zoo in 2014. Her male companions, Jasiri and Kyoda, were born at Monarto Zoo in 2008 and 2009. All three monkeys have called Adelaide Zoo home since March 2018, where they have been busy wowing visitors with their striking appearance and energetic leaps. Kyoda is very comfortable around his keepers, while Jasiri is a very gentle colobus who prefers to spend his time sitting quietly with Charlie. As leaf-eaters, these black and white friends certainly know the importance of eating their greens! Every day they are given a mixture of yummy ingredients nicknamed ‘primate cake’ by our keepers, which is filled with all the vitamins and minerals they need to stay healthy. Here at the zoo, they also enjoy snacking on chopped up fruits and vegetables, but fresh leaves ripped straight from the branch are definitely their favourite. 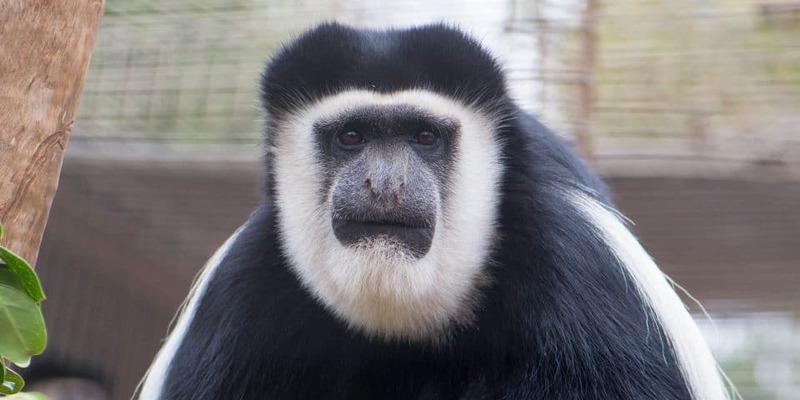 Black-and-white Colobus monkeys are known for their striking physical features including their glossy black colouring, a long, white mantle of hair that extends from their shoulders to their lower back, and some very long tails that end in a huge white tuft. These stunning monkeys live in social groups of up to 15 individuals, normally led by a singular adult male. Black-and-white Colobuses can be seen bounding through tree canopies, leaping from branch to branch and emitting impressive roaring vocalisations. The woodland and forest habitats these guys are found in range from Nigeria, Cameroon and Gabon in central western Africa, to Kenya, Ethiopia and Tanzania in the east of the continent. Colobus babies look very different to their parents – they’re completely white! After a gestation period of only five months, mothers give birth to an infant that quickly becomes the focus of the troop’s attention, with the bub being carried around by most members of the family. After almost a year, the little one no longer needs to be fed by mum and becomes fully independent. Not all Black-and-white Colobus monkeys are the same – eight subspecies are currently recognised. Sadly, many of these subspecies are under threat from deforestation and habitat destruction for agriculture. These gorgeous monkeys have also historically been hunted for their impressive pelts, and killed for the bushmeat trade. Want to make sure Colobuses stay a bound ahead of extinction? There are heaps of ways you can support these remarkable monkeys.